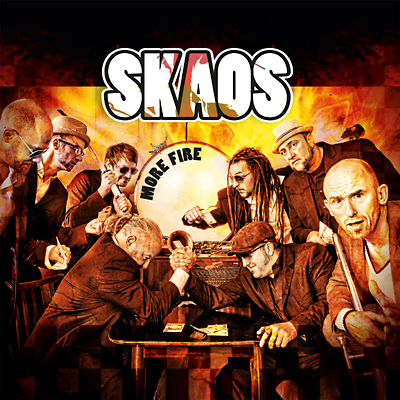 Skaos definitely belong to the Champions League if you talk about contemporary and modern ska. Since they formed in 1982 , the " Invincible Seven" have earned worldwide first-class reputation with their distinctive and party compatible ska - mixed without blinkers from solid offbeat , hard rocking guitars , a powerful horn section and catchy tunes sung with a rough voice. It took a whole decade, until SKAOS came up with their new album "More Fire " and once again literally light a fire under under our bums. Of course, the expectations are really high, but the band also sounds so fresh and enthusiasic in playing this time again, as if they were about to record their debut album. "South Africa" ? ?, "Oh Sally" or " Bonehead ". Nighter smashing party stomper "Shake It Up" or " Do The Shingaling " to the pop hymn and catchy summer tune tune called "Sunshine". With new additions to the line up made ? ?in recent years - FREIZIG saxophonist , keyboarder BONGO and trumpet player Dr. GOMME - that musical rejuvenating autohemotherapy has put it's efffects on the new album, but also on their exvcessive live shows in Germany and many other countries like Japan or England. Last but not least, the strictly limited first edition of "More Fire" being released as a PORK PIE Silver Jubilee Edition comes in a digipak with booklet containing all the song lyrics.